Long time member of the New 49er’s, Lee Kracher was born in Omaha Nebraska. His first introduction to gold mining was when a customer of his (Lee owned an electronics store in Orville California) wanted to trade a 2 ½-inch Keene dredge in exchange for a CB radio and antenna. Lee made the trade and began carrying the dredge around in the back of his pick up truck. Lee tried using the dredge in different creeks. 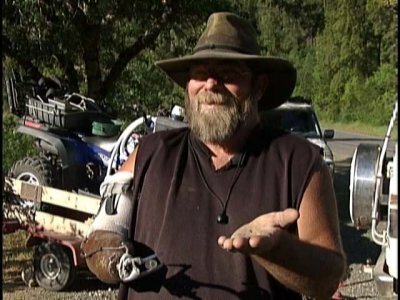 But it wasn’t until he was up on theYuba River during 1973 that he met Bill Crestman and ‘Hardrock” Hendricks. Both of these men were very well known for their gold mining experiences. Bill Crestman saw the dredge in Lee’s truck and invited him up to his claim. 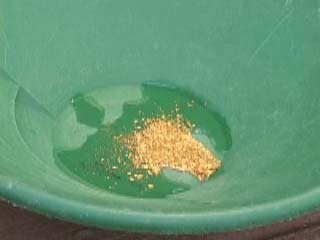 On the first day with their help and guidance, Lee was able to recover 2 ounces of beautiful, shiny gold. Prior to this, he had tried a dozen different times on his own and only recovered about 5 grains of gold in all. After several weekends of working with his mentors, Bill sold Lee his first 4-inch dredge. Soon afterwards Lee recovered about 6 ounces of gold on his own. This prompted him to go back to Orville and sell his electronic business. 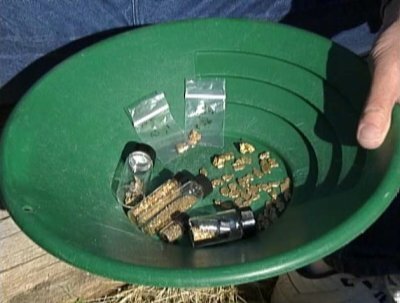 After he bought his own 6-inch dredge, Lee recovered over 66 ounces of gold on a single day. That day’s take included 1.5-pound and 2-pound nuggets. It was his best day ever. He worked everyday for 6 weeks, cleaning his recovery system several times a day. He was recovering large amounts of gold on every clean-up. He says the pay-streak was in ancient streambed gravel which was from 6 to 10 inches thick. Besides mining, Lee has led a very interesting and exciting life. At 17 years old, he went into the Naval Air Force and ended up flying patrols in Vietnam. A country boy, he has participated in rodeos as a roper. Lee’s nickname is ‘Cowboy,” and it is well-earned. Lee’s wife, Anita, was born in Indiana. She and Lee met in Orville, California. Together, they owned a cattle ranch in Missouri. Anita is a cardio vascular technician who has traveled extensively in that line of work. She is also a licensed massage therapist. She started mining about 5 years ago when Lee bought a 4-inch dredge for her. She credits him with having taught her everything she knows about mining. Gary Price is one of Lee’s happiest students. 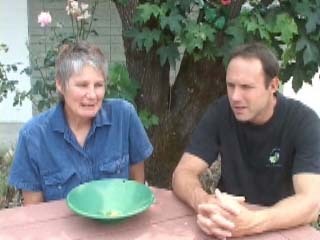 He says Lee taught him how to find gold along the Klamath River. 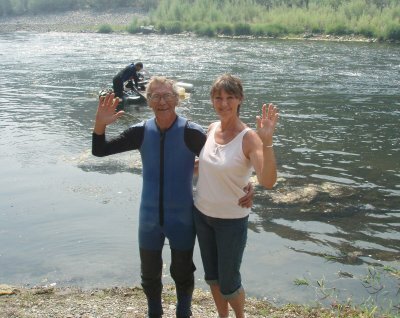 This season, Lee and his wife Anita have taken over as camp hosts on our K-15A claim at Savage Rapids. This is one of the season’s most popular campgrounds this year ‘ largely because Lee and Anita have been so helpful to other members. Besides running his own dredge along the river, Lee has invested a lot of his personal time teaching people the proper method of panning, high banking & sluicing, crevicing, and much more. He also demonstrates what hard-pack streambed is, how to locate the gold path and follow it into high-grade pay-streaks. This is all very valuable to newcomers. Lee’s boat has made many trips across the Klamath River full of hopeful new miners this season. I have spoken with several beginners that he has taken under his wing. They are all excited about what they have learned from Lee. Because they were taught that mining takes work, practice, and perseverance, they have not become discouraged after just a few days, but have remained at it long enough to get through the early steps of the learning curve. Now they are having a great time prospecting on their own! Rita Matson and Tom Knap say that they feel compelled to help other new members because of all the assistance they received from Lee and Anita when they first arrived. I personally have seen The New 49er’s concept of Miners helping miners in many ways. From the simple act of giving a ride to someone, helping out with a need, or allowing new inexperienced members learn side-by-side with the more experienced.